Summer. Summer. Summer-time. It’s been super hot and humid in Boston this season which is keeping me far far away from the oven and stovetop. So, it worked out well that this month’s Recipe Redux theme is “No Cook Meals” to beat the summer heat! This Summer, I’ve been relying on lots of salads for lunch as a way to use up all the fresh salad produce I’ve been getting in my CSA, ie. lettuce, radicchio, radishes, arugula. It’s been heaven. Last weekend, Steve and I went to visit my cousin and her family in Brimfield, MA where they were staying for the Brimfield Antique Show. It was nice to get out of the city and be somewhere remote for a change. While in the area, we stopped at a farmstand where they were selling beautiful peaches for $0.25 ea. What a steal. We loaded up our bag with these as well as a pint of blueberries. The blueberries lasted about 5 minutes in the car – they were seriously the best tasting blueberries I’ve EVER had. If you’re ever in Brimfield in July…. We did manage to save the peaches. Well, some of them :). 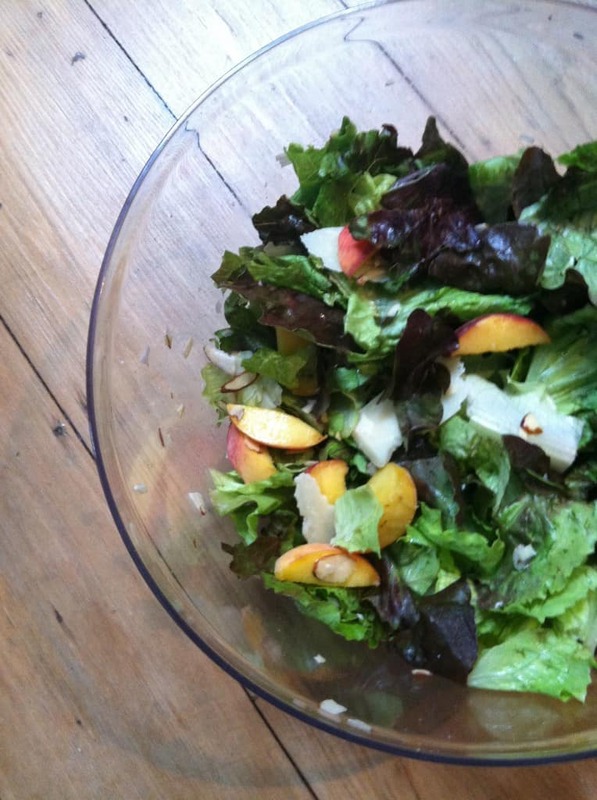 With our farm fresh peaches and CSA produce, I whipped together a quick n’ easy Summer Salad. Simply combine salad ingredients. Whisk dressing to combine ingredients. And voila! 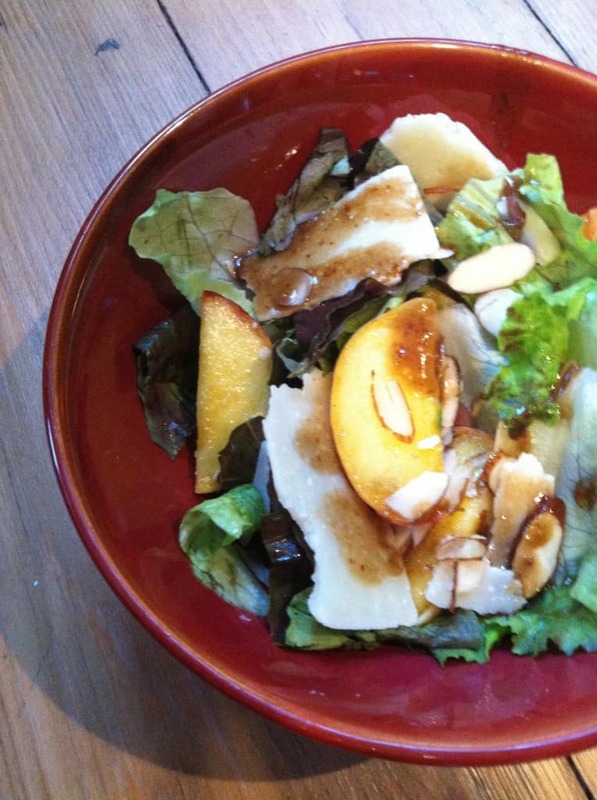 I have to admit that I wished I had a grill because this salad would have even more amazing with grilled local peaches!! This looks great! I just got some peaches in my CSA yesterday so might have to make this tonight. Come and share your delicious recipe with my CSA link party…http://inherchucks.com/2012/07/19/whats-in-the-box-35/. Hope to see you there! I never ever get tired of all the fab salad combos from summer fruits & veggies! peaches are so tasty right now. what a great addition to salads!